Weekend is right on the corner so why not to start preparing today a nice Barbecue? 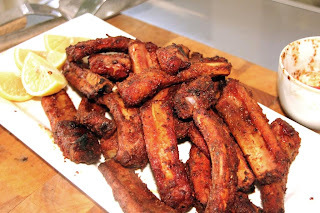 Here is the recipe for my Yabba Dabba Doo Rib Rub. You can make them in the oven and they are perfect footie night "material", to be washed down with heaps of beer. Best result though is to make them on a nice charcoal grill such as a Weber Kettle (that's what I got at home and I am pretty happy with it). The Charcoal grill will work as a smoker and will add some lovely smoke flavor to your ribs - hard to resist I say. I also add some wood chips to the grill for extra flavor. If you are not up to the long run, one hour at 200C (390F), wrapped in foil plus 15-20 min without the foil to smokiness and color will do the trick for both Kettle and Oven. Now! Wilma!!!!!!!!!!!!!!!!!!!!!!!!!! Set up the Table! Yabba dabba doo here comes the ribs!